I was an avid yankee candle fan. 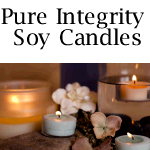 After burning Pure Integrity Candles I will never go back to Yankee. Your candles are the very best Your rating system for candle fragrance strength is right on. Please keep up the good work.I am a customer for life.